The Ford Fusion is a superb choice for a midsize sedan, with its impressive driving characteristics, advanced technologies, and comfortable and spacious interior. 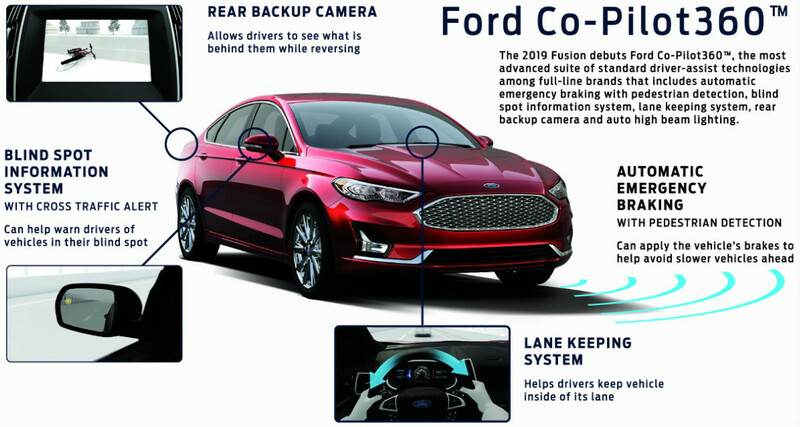 Ford recently unveiled the all-new 2019 Fusion, which has updated styling and many new features, including the standard Ford Co-Pilot360 suite of driver assistance technologies. The all-new 2019 Ford Fusion — which made its global debut at the recent New York International Auto Show — will be released in late summer 2018. The biggest news for the 2019 Ford Fusion is the Ford Co-Pilot360. The Fusion is the first Ford vehicle to come standard with this cutting-edge suite of driver assistance technologies. Features of Ford Co-Pilot360 include the blind spot information system, automatic emergency braking with pedestrian detection, lane keeping system, auto high-beam lighting, and a rear backup camera. Ford Co-Pilot360 also offers a number of available convenience features, including Travel Link, SiriusXM Traffic, and voice-activated navigation. This is in addition to the SYNC 3 infotainment system, which comes standard on Fusion SE and above grades. These grades also come with a WiFi hotspot, with connectivity for up to 10 devices. The Fusion received some minor styling enhancements across the trim lineup. All Fusion models have a redesigned front and rear, with a chrome grille on the S, SE, and SEL grades and a chrome mesh grille on the Titanium grade. Additional new styling updates include a new trunk lid panel and new wheels, LED taillights, and fog lamps, as well as many new color choices. This entry was posted on Tuesday, April 3rd, 2018 at 6:00 pm	and is filed under Ford Fusion. You can follow any responses to this entry through the RSS 2.0 feed. You can skip to the end and leave a response. Pinging is currently not allowed. I thought ford was discontinuing all sedans with the exception of the mustang?